St Benedict (AD 480-550) was the first recorded saint to create a garden at his monastery, as a place for prayer and contemplation. His was a rose garden or 'rosary'. It was St Fiacre (an Irish Saint) in 670, however, who became the first to plant a garden in honour of Our Lady, using those flowers which bore her name. This idea quickly spread throughout Ireland and England, with many “Mary Gardens” being created to honour our Lady. These were places often close to a church, where people could go to spend quiet time in prayer with our Lady. They were often enclosed gardens with a simple statue of the Blessed Virgin, surrounded by the shrubs and flowers which had been named after her. In Britain, so many plants originally had Marian names and meanings, that it was actually possible to have themed “Mary Gardens” based around particular attributes of Our Lady and her life – a garden specifically devoted to her virtues, or her earthly life, or her joys and sorrows for example. Mary Gardens flourished right up to the time of the Reformation. The Marian names and symbolism of the flowers of pre-Reformation England were largely omitted from English herbals and gardening books produced in the 16th century. In a short space of time, 800 years of floral Marian connections and symbolism had disappeared from our gardens and countryside along with the monasteries and shrines. In 1932, St Joseph's Church, Woods Hole, Massachusetts, decided to redress the balance, becoming the first church in the United States to plant a Mary Garden. For their inspiration, they took the plants of old Catholic England. From this small beginning, the movement spread across the States and an association was set-up to specifically promote Mary Gardens. Today the Marian Garden is a bold statement of Catholic Faith in a secular world. It expresses our pride in our Catholic roots and our love of our ancient heritage. 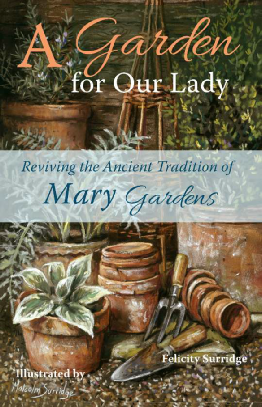 Here is an exquisitely illustrated guide to creating a Mary Garden in the home, parish, school or monastery, with an extensive guide to traditional English plant names dedicated to Our Lady, their legends, use in art and in prayer and meditation.